Dangerous cults present its leaders as Messiah-like figures. When cults do this, it reinforces the idea to members that they should not or cannot question their leaders. Over the last few years, Elevation Church and C3 Church have embraced their leaders as Messianic figures. Now a Messianic title has been placed on Kong Hee by their CHC’s Missions Director, Bobby Chaw. 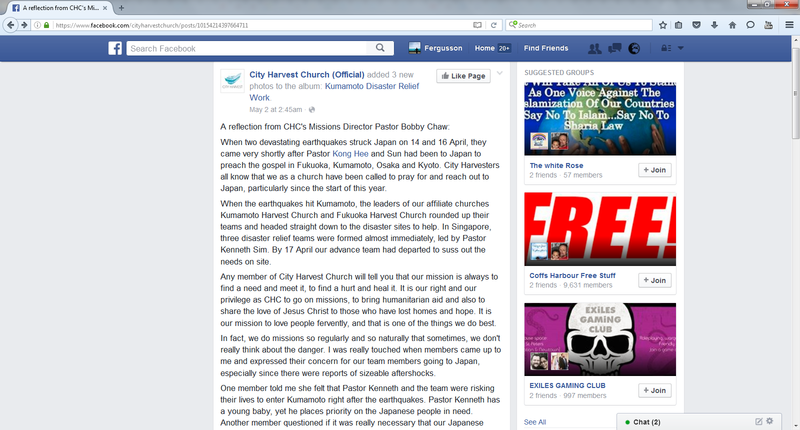 CHC’s Missions Director Pastor, Bobby Chaw, decided to take a nasty swipe at Kausikan and at the same time crown Kong Messiah on an Official CHC Facebook post. ” worker of lawlessnes” (Matt 7:21). Before God and His Word, Kong Hee is a hardened criminal, still using the name of Jesus and hiding behind his good works to give the impression he is a “Christian” and a “minister”. Kong Hee was never qualified to begin with to take the pulpit – his false gospel proves this (and also his false credentials). Kausikan has every right to call out Kong Hee. Sadly, Chaw is CHOOSING to stand with the false prophet Kong Hee. Christ is looking for REPENTANCE not “all that [Chaw and Kong Hee] were doing for Japan”. In our Chavez article above, we pointed out that Luke 7:35 is Jesus talking about Himself. Kong Hee is not God. Kong Hee is not the Messiah. Kong Hee is not Wisdom. Jesus is God. Jesus is the Messiah and Jesus is Wisdom. Jesus’ disciples [Christians] follow Christ and contend for the faith and believe the bible. Kong’s disciples follow Kong and contend for his ministry at the expense of clear biblical teachings and Christ. They do not know the gospel, remained hardened and unrepentant to the Christian faith and condemn any Christian who elevates the teachings of Jesus above the teachings of Kong Hee. The results are evident when you look at how CHC followers twist the scriptures to justify the unjustifiable behaviour of their CHC Messiah. CHC followers do not believe the bible, otherwise they would listen to the teachings of Jesus and his Apostles and apply their instruction in dealing with Kong Hee and his immoral wife Sun Ho. Instead you get these false converts twist Jesus’ Words to condemn Christians judging their false shepherd. If Chaw really loves Jesus, he would heed Jesus’ warning in Matthew 7 and seek to work in a ministry where the tree and its fruit is good. Pray for him to repent of his sins and return to his first love. When two devastating earthquakes struck Japan on 14 and 16 April, they came very shortly after Pastor Kong Hee and Sun had been to Japan to preach the gospel in Fukuoka, Kumamoto, Osaka and Kyoto. City Harvesters all know that we as a church have been called to pray for and reach out to Japan, particularly since the start of this year. When the earthquakes hit Kumamoto, the leaders of our affiliate churches Kumamoto Harvest Church and Fukuoka Harvest Church rounded up their teams and headed straight down to the disaster sites to help. In Singapore, three disaster relief teams were formed almost immediately, led by Pastor Kenneth Sim. By 17 April our advance team had departed to suss out the needs on site. Any member of City Harvest Church will tell you that our mission is always to find a need and meet it, to find a hurt and heal it. It is our right and our privilege as CHC to go on missions, to bring humanitarian aid and also to share the love of Jesus Christ to those who have lost homes and hope. It is our mission to love people fervently, and that is one of the things we do best. In fact, we do missions so regularly and so naturally that sometimes, we don’t really think about the danger. I was really touched when members came up to me and expressed their concern for our team members going to Japan, especially since there were reports of sizeable aftershocks. One member told me she felt that Pastor Kenneth and the team were risking their lives to enter Kumamoto right after the earthquakes. Pastor Kenneth has a young baby, yet he places priority on the Japanese people in need. Another member questioned if it was really necessary that our Japanese interpreter Naomi Matsuda-Lee go on the trip as it was risky. Thing is, none of those on these three teams ever let such questions stop them. To them, the needy must be reached and helped, the love of Christ must be brought to them, no matter what. We, the members of City Harvest Church, must continue to share the love of God to the broken and wounded. Let’s not be distracted or discouraged by unnecessary comments. Let’s focus on what God has commanded us to do and to be. Do share these links and videos—they are real, unrehearsed, on-the-ground reports of what our teams have been doing in Japan. Also, pray for the people of Japan, and for Pastor Yoji Nakamura of Kumamoto Harvest Church and his wife, Kyoko, who have both suffered great stress. Let’s do all we can to strengthen them. NOTE: SCREEN GRABS TAKEN BEFORE 14/05/206. ‹ The Sisterhood: The Real Heroes? Bobbie, No! Just No! my questions for chaw is …. IS wisdom vindicated by the false prosperity gospel of kong hee? another questions for chaw is …. how IS kong hee’s ripping off chc a good moral character and a good deed? IF chaw wants to be an honest man then FIRST he must preface any statements with the truth explaining their glorious leader couple kong hee / sun ho has definitly ripped off chc. otherwise chaw’s guilty of omitting truth to cover kong’s lie therefore committing chaw’s own lie. 2 wrongs dont make a right, 2 lies dont make the truth.